President Obama’s recent suggestion that Columbus proved the earth is round continues to bother me for a number of reasons. In this case, when he appears to be speaking without a script, his words reflect his own lack of historical knowledge. That it wasn’t immediately seized upon as a significant mistake suggests that many people don’t realize it’s a myth. Certainly, few if any of the people who heard him and laughed seemed to recognize it as a mistake. Apparently, basic historical ignorance is common in the U.S. (this isn’t really surprising, but it is unfortunate). Perhaps most upsetting, for me, is what President Obama’s mistake reveals about the marginality and insignificance of the history of science in our culture. The sphericity of the earth, thus defended by Aristotle, would never be forgotten or seriously questioned. The widespread myth that medieval people believed in a flat earth is of modern origin. As he points out in his notes and others have pointed out at much greater length, the source of this myth at least in the North American context is the writer Washington Irving, who made it up in the 1820. For longer treatments of this myth, see J. Russell, Inventing the Flat Earth and C. Garwood, Flat Earth: The History of an Infamous Idea . Andrew White helped cement in popular culture the flat earth myth. Yet, if historians of science have been railing against this myth for so long, why do all of my students year in and year out arrive at Haverford College having been taught this myth? And why does President Obama repeat it? One important answer seems to be that historians of science have not been effective at communicating their expertise to a broader audience. 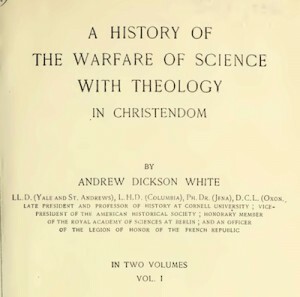 We have surrendered this domain of knowledge to writers and people who have a vested interest in using the history of science in their own contests. It is not accidental that the Columbus myth was widely disseminated by John Draper’s History of the Conflict Between Religion and Science and Andrew D. White’s History of the Warfare of Science with Theology , two books that largely constructed the idea of some inherent conflict between science and religion and did considerable violence to the historical record to demonstrate that conflict. In the end, President Obama’s mistake reflects as badly on historians of science as it does on the president. Rather than simply bemoan his lack of historical knowledge, we need to push back from our desks, step out of our offices, and retake our domain of expertise in the public sphere. Maybe that means working with high school teachers to design curricula. Maybe that means taking the chance to offer public lectures. Maybe it means spending a couple nights a month teaching a night class for adults. If we don’t begin to think more broadly about our place in society, then we are contributing to our own marginalization. The common claim that Columbus proved that the earth was round is the zombie myth from hell. It refuses to die. Every year students arrive in my intro class having been taught that people in the Middle Ages believed the earth was flat and that Columbus proved them wrong. This past semester, every student believed this to be true (see my post on the “Biography of a Map”). Recently President Obama claimed that if opponents of alternative energy had lived during Columbus’s time they would not have believed that the earth was round and that they would have been founding members of the Flat Earth Society. There are two problems with this claim. First, Columbus and his contemporaries did not believe the earth was flat. Second, the Flat Earth Society was not founded until the late 19th century (if you can believe the website). See his comments at 1:05–1:10 on this video. It is appalling that President Obama would repeat this “Columbus proved the earth was round” myth. 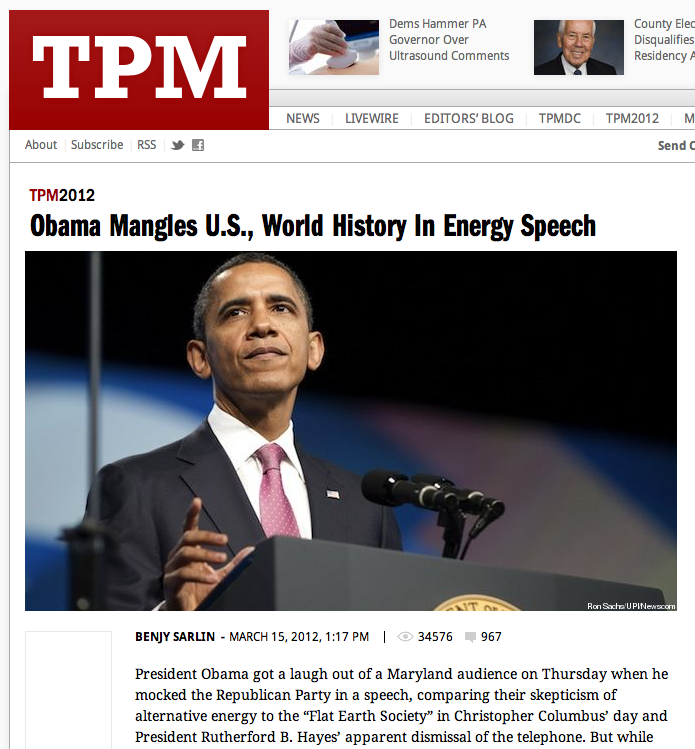 TPM calls Obama out on his use of history. Interestingly, only a few places have called President Obama on his error. 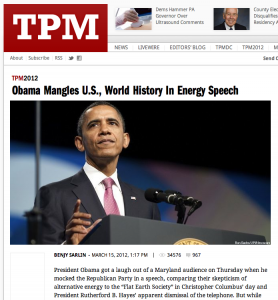 TPM points out his mistakes in “Obama Mangles U.S., World History in Energy Speech. Strangely, they cite Stephen Jay Gould’s book Dinosaur In a Haystack (1995) rather than readily accessible articles that confront this myth. By citing Gould’s book, they fail to understand how this Columbus myth was the creation of 19th-century Protestants who wanted to portray the Catholic Middle Ages as anti-intellectual. The Columbus myth does work for these anti-Catholic and later anti-religion polemicists. Two readable articles are J. Russel’s “Inventing the Flat Earth” in History Today 41 (1991) and L. Cormack’s “That Medieval Christians Taught that the Earth Was Flat” in Galileo Goes to Jail and Other Myths about Science and Religion (Cambridge: HUP, 2009), 28–34.